Below we describe “the anatomy of the deep state,” the nature of the deep state, and its implications. When we say “deep state,” we aren’t just talking about elected, hired, or appointed officials, but those and all the forces that surround them (many of which are unelected and come to power via wealth, merit, social networks, or bloodlines). This thing is left or right, it doesn’t share social or economic stances, and it doesn’t all want the same thing. It is, like a human body, many forces working in tandem, some coordinated, some not, all naturally organizing in a system and sharing power to create a Frankenstein’s monster of sorts. The Deep state of a given nation, both those hired, appointed, and elected and those who came to power without elections; both in the private in public sphere, the agencies, the contractors, the politicians, the lobbyists, etc. The entities within a given “Deep State,” so for example, a nation’s intelligence community, a nation’s major companies, and those individuals and groups they interface with (a “Deep State within a Deep State”). The International Deep States (“the body politics formed by collections of Deep States; and those that form and influence collections of deep states”). So, the international order that arises from the shared intentions of many Deep States and what I’ll call “Deep Actors” (those who have the power to affect global Deep States). Taking America as an example then, when someone says Deep State they could be referring from anything from the last round of bureaucrats placed in power (like Obama’s Deep State Trump is weary of), to the aspects of the international [often American led] liberal western order that permeate the states of western nations, to the Deep States of other countries that opposed the liberal order. So the western alliance (taking into account all the elites, oligarchs, militaries, ruling families, etc) is one flavor of Deep State, each force within the western alliance (such as intelligence communities) that moves freely and has its own intentions is a form of Deep State, the military state created by Erdoğan is as equally a Deep State as the secular Deep State he purged, and Deep State of Russia that opposes the western alliance (denoted by Russian oligarchs, the KGB, and longstanding Russian interests) is also a Deep State, Germany’s Deep State that Hitler purged is a Deep State, the bankers who Hitler took loans from are a form of Deep State, the state Stalin purged is a Deep State, the bankers Stalin took loans from, the western alliance that fought against them, etc, etc. In words, there isn’t just one “Deep State,” and thus what is meant by the term depends very much on context! That truism means we have a long page ahead of us. Also, the secrecy of a given Deep State means we have to tread a bit carefully when we make bold claims and have to consider that there is a lot of unknowns and mythology filling in the blanks. TIP: One way to loosely denote the complexity of the Deep State is by acknowledging there are levels to this disorganized almost naturally occurring amalgam of things we call by the name “Deep State.” For example in the video below Ron Paul mentions a part of the CIA and says “the deep, deep state” when contrasting it with other aspects. Generally we are talking about the part of the state that has economic and power interests, but its really a loose web of different types of entities that have direct or indirect power and do or don’t coordinate to any degree. It is a complex thing, it isn’t something that well-intentioned do-gooders or not-do-gooders just “win” against. It is a bit like a person cutting off their nose to spite their face, the best they can probably accomplish in real life is a nose job and some medicine if they get a cold. Anatomy Of The Deep State: An Open Conspiracy. TIP: The video below describes the neoliberal Deep State, that is roughly the western alliance as it takes root in America. So oligarchs, military state, intelligence community, bankers, and their circles (sometimes working together, sometimes alone; either way it creates an unelected shadow government that dictates aspects of policy… especially intelligence, finance, military, and foreign policy). It is the kind of state that results in us carving a canal through Panama, setting up a federal reserve, beating up on Castro for his Communism, or that explains our position in the middle-east. From a sober angle, the goal can be summed up as “protect American interests” (by ensuring power). Now is that a bad thing? My personal opinion is… “ugh, not really though if you think about it… in fact it is a bit necessary and natural isn’t it?” And that my friends is only one small part of the complexity here. The Deep State Hiding in Plain Sight. TIP: One could postulate that the class system, like the Deep State, is naturally occurring. That any form of government (global or national or local) will have actors who float to the top beyond the positions money, merit, or election can reach. If these positions aren’t carefully filled with philosopher kings, then some other force will take the position. If corruption is not accounted for, then how can we expect no corruption. This leaves even those with the best intentions on a slippery slope. The graphic below shows what I believe to be a rather accurate modern power structure of any modern nation/the globe. This structure has essentially always been consistent, the only thing that changed in recent history is Churches and Kings got pushed further down the pyramid…. those oligarchs and timocrats though. 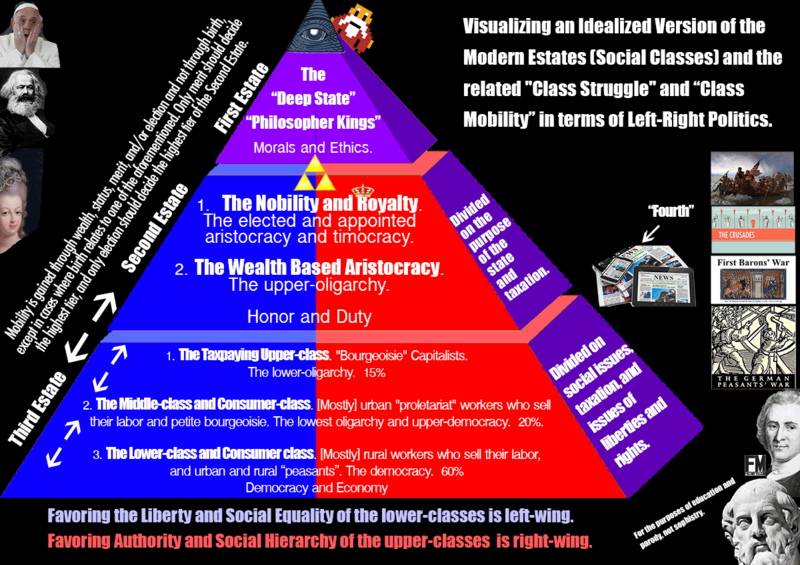 Visualizing an Idealized Version of the Modern Estates (Social Classes) and the related “Class Struggle” and “Class Mobility” in terms of Left-Right Politics. See how we called the top of the pyramid Deep State. that isn’t a judgement call. That is a realization that the Church, the Deep State, a Philosopher King, and other like bodies work in a very specific and naturally occurring way. I don’t think you can get rid of this…. only replace it with something else. Is the Deep State Liberal Or Conservative? What are Its Goals? Generally speaking, partisan factions within the Deep State aside, the Deep State state isn’t socially left or right, socially liberal or conservative, democrat or republican, it doesn’t care about social issues, and it doesn’t care about what faction is in power. It is (in classical terms) not a democracy, but is instead a mash-up of aristocracy, timocracy, and oligarchy. It is American interests, international interests, oligarch interests, military industrial complex interests, intelligence agency interests, global elite interests, and the interests that connect them (so money and power, or, just power). What is the ends of that power? It differs by entity, but the general intention is somewhere between purging X group, ensuring world peace, and ensuring more power (ensuring a seat at the top of the pyramid). Here I would say that the exact goals depend on which type of Deep State we are talking about. At best, the Deep State of a nation puts the interests of its nation (and further its alliances) first. That means, power aside, beyond that different Deep States have different interests. For more reading, see: Essay: Anatomy of the Deep State and Anatomy of a Deep State. It’ll help explain the different aspects of the Deep State and how in a democracy like America it isn’t one thing, but many. Although the term Deep State can be used in context to imply a certain subsection of the ingrained establishment (“the liberals,” “the secularists,” “the conservatives,” “the globalists,” those who support “X” leader), as eluded to above, Deep State is a neutral term at its heart. It doesn’t describe a good or bad thing (at its core), it just describes an inventible feature of any government that survives more than one administration (or in other cases elite interests that survive generations), an ingrained establishment that isn’t subject to regular popular elections. James Bond’s MI-6 is a Deep State entity, so is the KGB, sometimes autocrats need to get rid of the Deep State to ensure despotic power, sometimes the Deep State needs to ensure the National Interest / Common Good / General Will (these terms are synonymous in their true form; it is the difference between justice and true justice) against despots. Sometimes a political body functions like a healthy body, with the Deep State, Media, and other organs-of-the-state acting as a sort of immune system, and none of this really needs to be discussed. Sometimes things get wacky and this sort of conversation becomes more relevant. In all cases, the topic opens the door to describing some really interesting political concepts. TIP: The Former CIA officer below is explaining the intelligence community aspect of the Deep State. That is like one arm of the Deep State, it moves independently, but it also follows a shared general direction. There are a few themes here, one is that there was very little democracy going on, the other is the general support of what we can call “neoliberal” (pro-globalism and pro-business and pro-deregulation) interests. Former CIA Officer Kevin Shipp on the Deep State Updated 3/26/17. Before we get into the philosophy of Deep States, let’s start with two examples of Deep States, 1. Turkey, and 2. the U.S. (as both speak to how the term is used today). In Turkey, Atatürk (“Father of the Turks”) wanted to create a somewhat liberal and secular state, and he did from 1923 to 1938. After his death he put the military in charge of ruling the state in his vision, and it was ruled that way until modern times (with many revolts and stories to tell, but they aren’t the story here). In modern times, the more conservative Erdoğan began to take power and, in an effort to change Turkey, “purged” the Deep State left behind by Atatürk. Here Erdoğan “purged” the engrained establishment that governed from behind closed doors. It would have been near impossible for Erdoğan to make sweeping change without changing the old guard, because the “Deep State” in this instance was largely loyal to the National Interests of a different era. In the United States, members of military, other executive agencies like the FBI, and Congress don’t have the same term limits Presidents do. This creates a sort of Deep State that consists of liberal, conservative, and many other interests, appointed in different liberal and conservative eras, who help run the show out of the public eye. When a new President comes in, and they often fire some of this old guard and replace them with those who will further their agenda (this is the Democratic version of “purging the Deep State;” Clinton fired Sessions, Trump fired Comey, these aren’t the same situations, but they are PC examples of the democratic version of this). As you can see, neither the Deep State nor the replacing of its positions is inherently wrong, but there are countless ways for this to go wrong (both for the new administration and for the current state). This is especially true under an authoritarian who wants to make sweeping change and under a deeply ingrained state with differing interests. Now with the above said, you’ll notice I use the term Purge (that is because the oustings are not always nice and very often include the jailing and murdering of political figures, intellectuals, citizens, and journalists). Speaking loosely, we can say: NAZIs “purged” the Deep State on the Night of the Long Knives and that the Jacobins of the French Revolution purged the Deep State in their Reign of Terror. Oliver Cromwell, he also purged the Deep State, and when the State was retaken it was purged again. Lenin, Stalin, Caesar… if we use the term loosely, we can see that both creating a Deep State and purging it are common threads of history. Lastly, before moving on, you’ll also note that above I specified that both liberal, conservative, and other interests comprise the Deep State, this too is on purpose. After-all, any Deep State built over time will include a number of different interests. In modern times we can always consider those interests to be very generally: liberal, conservative, and/or economic (and different flavors of these). In the best light the interest of the Deep State is the interest of a wise and seasoned senator, “purely the national interest despite their personal partisan interest,” but of course… in any country, there is often not a consensus on national interest, nor is the direction of any state constant. If this seems complex…. it is probably because we are discussing a complex aspect of states and “shadow governments” (a term that describes those who rule “from the shadows” so a corporation that lobbies, a celeb who influences, a member of the Deep State, or anyone with power who we can’t see influencing us directly). TIP: Putting aside the idea that there are actors behind the uprising of Hitler and Stalin, and keeping the focus on the Deep State western-liberal-interests lets talk about Deep State purges. Hitler’s night of the long knives is an example of the far-right purging the Deep State. Now, all things considered (bank loans, many dead fascists and communists, America arising as a super power) we can speculate that this sort of thing was planned… but that theory doesn’t exactly work for me. All signs point toward opportunism (that is, the Deepest parts of the state are set up to take advantage of all scenarios from best case to worst case). Why do I assume this and not the conspiracy? The answer is that it is a better tactic. WORLD WAR II THE NIGHT OF THE LONG KNIVES Discovery History Military full documentary. With some basics covered, let’s consider this from a more philosophical angle. Consider, the “body politic” (a political body) consists of all the members of a nation. Those sovereign people, necessarily in large nations, delegate power to official and unofficial political bodies (government). This political body has heads (leaders), limbs (branches), and organs (agencies). The purpose of all parts of the body are the same as the purpose of a normal physical body, to rule in-line with the common good AKA the General Will (so in-line with “national interests” AKA the Common Good of the State; power is delegated by the people, not taken by Kings or given by Gods, thus the interest of any part of the body can’t diverge from the interest of the body as a whole). It wouldn’t make sense for a healthy body’s arm to cut off its nose, and likewise it doesn’t make much sense for a political body to war with itself. However, the body is constantly fighting off outside influence and working with other parts of the body, and thus the general metaphor works. A government of a political body is formed from those who have short term positions and longterm positions, and from those who are elected and known to the public, and those who are hired or appointed and often unknown. Here elections are important, because they allow the citizens to “check the state” and that “creates balance”, but with the Deep State (which is a term that describes the ingrained establishment of many organs) direct elections are not ideal because these positions demand that they be picked on merit and not popular consensus (they should be an aristocratic meritocracy and moral-ethical technocracy). The “Deep State” then is the collective coordinated and uncoordinated interests, of those who are generally unknown and often appointed or hired, who have longterm positions in the different organs of government (mostly, some are actors outside of government) based on merit (ideally, as we all known birth, networks, and money are all common “corrupting” factors). Overtime, this political body whose interests are not purely party interests or corporate interests (ideally), but are the interests of the national interest (ideally), forms, by its nature, what we can call a “state-within-a-state”. To the extent this state-within-a-state has a doctrine which is just, fair, reason-based, ethical, and in-line with the National Interest / Common Good, it is good! In fact, this can be very good and create a sort of ethical and neutral focus on matters not subject to political whims, that can focus 365 days a year without worrying about outside social forces. A healthy political “organ” preforms vital functions for the political body no matter the ruling party (preforming the same function for a left-left party, as a far-right, as a center left, as a center right, as a single voter issue party, etc). However, basic reason and logic will show you the sticking point. That this can be problematic if that Deep State is corrupted and, for whatever reason (the reason is almost always money). When the will of an organ is not in-line with the General Will, it is akin to cancer in a physical body. No organ is worse off being effected than a deep ingrained organ like the Deep State, as its members can’t just be unelected by popular vote. Luckily, the Deep State, in a just nation, should have a natural immune system. A just state should produce just citizens, and although rank, title, and power is delegated in a political body, all people of free states are born first and foremost citizens. So, the Civil Religion of a just state, paired with the fact that old-timers and new-timers work side-by-side gaining their longevity over time, these factors of seniority and virtues of honor and duty and love of country, should be enough to ensure that even when a J. Edgar Hoover goes too far in his old age, the organ endures past a few bad actors. An illustration of the basic forms of government. Hobbes’ imagery re-worked to show the forms, the body politic, the head(s) of state, and the arm of the executive and legislative. See how the political body breaks into factions and starts to destroy itself. Cute illustration, right? We don’t want “factions” to destroy the political body, thus aristocracy is a good choice. We can think of one head as the Deep State, another as the ruling party, another as Mainstream media, etc. The heads, many or few, that control the estates, directly or indirectly. And that brings us to one of the dark conspiracy minded meaning behind Deep State (there isn’t just one, there are a few), the one used by the autocrats of any nation who seek to control government fully, charges that this Deep State is working against their interests. However, while this isn’t impossible that a Deep Body would work against a virtuous leader, the idea that the Deep State, people, and leader can have conflicting wills is theoretically wrong. There is only one General Will, and thus there is only one National Interest. Since there is only one National Interest, than the Deep State and Party-in-power must have the same Will, and that will must be the same as the Will of the people. If those wills diverge, then one of the entities is incorrect. This is complex, but it suggests an answer in its complexity. It suggests that citizens, parties, and deep states are all natural advents of a political body. Thus, it suggests that when wills diverge there is need, not for purging, but for Democracy in some form, for the application of reason in an effort to confirm the General Will so the organs, limbs, and body can realign itself (“a democratic immune system”). In a democracy, all powers are meant to be checked and balanced, even complex powers that grow in the shadows, and even the powers of popular leaders who are lifted up to great heights by the people. In the old French the Estates of the Realm, the Deep Church State checked the Second Aristocratic Estate, and the People checked both. In the modern west, the same basic political dynamic can, will, and must occur, because it is the nature of a political body. Call these things organs, limbs, bodies, realm, or visible and invisible governments moved by visible and invisible hands, that is just semantics to describe real sociopolitical systems in-action as they seem to arise in common throughout nations and ages (inside and outside of government by the way, consider the wealthiest citizens who try to influence public opinion are part of a “Deep Civil State” and the influencers among the plebs are then the influencers of the “Deep Culture”; there are many natural forces that work for the public interest and specific interests, despots know this instinctually and use fear to oppress them). The problem is: When the party in power wants to purge the Deep State for reasons not in line with the General Will, or when the Deep State wants to control the party in power, for reasons not in line with the General Will, we start down a slippery slope. This is Madison’s factions, Bernays’ is Invisible Government, Smith’s invisible hand, Rousseau’s General Will, the French Estates, the Spanish fifth column, and the Leninist idea of political organs all happing at once. Would be much more interesting to discuss if it weren’t getting pointed at for political and conspiratorial reasons. So, we can boil this all down to: There is only one national interest, but many official and unofficial political organs with the power of influence within the main body which may arise naturally, one of these is the official Deep State, where Deep State specifically describes a state-within-a-state that forms naturally as longterm position are held in what we in American consider mostly “executive” institutions. With that in mind, in general with any group of influencers, there tends to be way less coordination and consensus than one might imagine, and rather most are driven by invisible social forces (AKA self interest and shared interest). One would expect the Deep State to be upholding national interests in-line with the General Will due to their rank and longevity, and thus would expect that those attacking “the Deep State” are simply trying to replace the old timers with those who will seek their political interest rather than the National Interest, but to think that is always the case would be naive. That is why we must employ reason, democracy, and other liberal and enlightened principles to complex situations and not move toward despotism via any “organ” based on whims, fancies, emotions, and special interests. Below we discussed the Deep State as a part of the body politic, as a part of the class system, and touched on its conspiratorial meaning. Below we’ll discuss it as a naturally occurring sociopolitical force. The “Deep State” isn’t purely the known government that we elected and who are subjected to public elections and term limits, it is [using the terms very loosely] a sort of “shadow government” that acts as an “invisible government” by way of visible and invisible hands consisting of some who we elected, those who the elected appoint, and those who were hired by the elected and appointed. More broadly, the term Deep State describes the official and non-official entities that propel forward national interests inside and outside the state, but whose faces aren’t known to the average person and whose careers aren’t at the whim of a popular vote. Those who help shape the direction and acts of the government from behind the scene. It is a official and unofficial coordinated and uncoordianted “shadow / invisible government”, where we mean it more like Edward Bernays, not as a scary conspiracy-minded thing, but as a natural advent of society where people act in their own interest (like Smith’s invisible hand; the shared self interest that drives social systems), and in this case, that interest is the general interest of the state and the actors are appointed and hired figures (mostly unknown to the public) in positions of influence (with, one would expect, reigned in powers in-line with the letter of the law in most cases; as unlike other shadow and invisible interest groups, this one is an official group with official duty). It is like how everyone at Apple touts Apple, is interested in Apple, and will defend Apple even if they don’t agree on the next product launch. It is like how at Apple some groups with shared interest in specific direction and with influence in the company will directly or indirectly coordinate to influence things and take minor actions, but it is not a well organized secret conspiracy that fully agrees and coordinates, nor is this body of actors fully known to the public. This is to say terms like “shadow government” and “invisible hand” don’t imply actual vast conspiracy, but rather describe the shared intentions of members within a group. In this case those shared intentions are, in a mundane sense, “national interests and not party interests”… the problem here, and the darker implication of the term, is however, “that parts of the Deep State have political interest which is not the same as the interest of the Party in power”. That aspect of the concept is mundane if not benevolent in some ways. It is a sort of naturally arising aristocracy which helps to ensure longterm stability and a focus on true National values (in our case liberalism, republicanism, democracy, capitalism and the other planks of our core ideology; instead of party politics which may be further left or right) over the course of decades (instead of everything changing completely with every new leader it creates stability and checks and balances; preventing power from consolidating under a popular leader or party). Sure, we can see a bunch of sticking points arising (everything from rouge elements to political witch hunts and power grabs), but those aside, there is a certain wisdom from having an old timer from the Reagan administration in office while Obama was getting his sea-legs. It creates a sort of balanced government over time and allows for the influence of major industries (which, like it or not, like a Union head, are major elements of a democratic, individualist, and capitalist nation). But here we just hit at the heart. This big and deep machine that spans decades by its nature limits the ability of elected officials to make sweeping changes and power grabs. The machine has its own set of interests that don’t change just because the people voted for a Revolution. Here I’m calling it a machine because that is a good term for it, it is a naturally arising political machine, be we talking about state politics or party politics. These machines, being naturally occurring, like a “shadow government” who shapes tastes and opinions, or an “invisible hand” that moves markets, can, must, and should be expected to arise in all governments that aren’t fear-based despotic totalitarian governments. Mussolini knew this, and that is why he created a totalitarian fascist regime, it was with this and only with this that he could ensure the state moved in lock-step direction toward his Nationalism. WWII got bloody for many reasons, but a big part of it was simply the removal of bi-partisan interests from the Deep State and what I call “Deep Culture”. FDR barely made it past the DNC in the Primary, that ingrained political machine of the American left-wing is strong (just like the right-wing machine), and we can imagine that the “shadow and real machine” behind the scenes that both parties answer to indirectly is even stronger (and less concerned with left-right politics; although everyone is human and thus has their own tastes and biases). That Deep State machine (here describing the invisible hand and loose coordination of many self-interested groups and individuals) isn’t going to take kindly to say: replacing Democracy with an Authoritarian government, or depending on the Nation, even replacing an Authoritarian government with Democracy. So, in the U.S., we can say, although there are some sticking points, the “Deep State” is probably a good thing on the whole. It is a bit like eating our vegetables, not as good a dessert, but functional. America is a global superpower, we have iPhones and chips and a minivan, why not protect that way of life? I mean at least Tweet our support or hit a like button. Well if only things were that simple. In trying times, like when Lincoln took office, Deep State can be translated to “a new perceived-authoritarian in power surrounded by their political opposition”. This creates creates an environment of fear and mistrust (Lincoln had good reason not to trust, was arguably doing the moral thing, but still, the concept of purging really never looks all that good on paper, even when ol’ Abe does it”). I don’t agree with those who say the deep state does not exist. It does exist. It has always has—and it did not start with the Republic; it dates back to Ottoman times. It’s simply a tradition. It must be minimized, and if possible even annihilated. And annihilate it he did, Erdoğan ‘Purge’ the Deep State ‘Saboteurs, no different from the WWII statist Communists and Fascists really. He accused the more liberal Turks of a coup d’état attempt and proceeded to pure the state in 2016 (and he had already done the same thing before). Today in America Obama is being accused a coup d’état, and Sean Hannity (of all people) has suggested “Trump must purge deep-state bureaucrats now”. This might sound smart to paranoid minds who dislike Obama, progressives, and neoliberals, but I’ll be darned if it doesn’t sound to me more like a line from Mussolini’s fascist Republican playbook. You see, if it is not that Obama is planning a coup, and rather that the other political side is assuming this in paranoia, it threatens democracy, liberalism, and capitalism (via authoritative protectionist doctrine). Turkey’s failed military coup, explained. So, at this point i’ve danced around a general idea long enough, and ultimately to get to the next section on enlightenment (and to be fair to the tyrants who purge the liberal state) let’s talk about “the other Deep State”… the international liberal conspiracy driven by the international banks. This theory charges that the goal of the international order is to create a New World Order that looks a bit like America looks today. That is, a secular and modern state with some aspects of capitalism, free trade, surveillance, and no state-based religion. The theory also charges that the pathway to this by infiltrating Deep and Secrete entities to control power sources and by amassing massive amounts of wealth (thus creating a sort of international oligarchy, aristocracy, timocracy). It is essentially what Hitler was trying to fight against in WW2… which makes the other part of the theory odd, as that part of the theory charges that this entity spurs on and then uses conflict to further its goals. For example, the charge is that the plan of the World Wars was to result in NATO (an international One World alliance of neoliberal interests backed by a military). I think it is clear that some of this is correct, again if we look at America we can see many signs of this, but unfortunately this theory also tends to be laced with conspiracy theories. For example, the video below will charge that satanism underlies this whole thing (which I think is a misunderstanding of secularist enlightened values). With that said, check out the following video for the conspiracy theory version of this topic… I’d urge you not to focus too “Deeply” on this one aspect, because it seems clear that the many other aspects are equally as important. THE DEEP STATE – 50 Year Old Recording Explains Why The World Is Going Crazy. With all the above said, be we talking about the Deep States of the western alliance, or the right trying to purge the left in a given state, or the religious trying to purge the secularists (or vice versa), or be we talking about intelligence communities or banksters, the true points of focus are really beyond this. The reality is, it doesn’t matter who is right and who was wrong in a given situation, if we react based on fear and create policies of fear, then we have embraced the virtue of despotism and we risk creating a despotic state (as if by an invisible hand). If we seek liberal enlightened values and justice, if we seek unity and not division, and if we seek correctness in general, then we all have a much better shot. The naturally arising power structure isn’t going anywhere, human nature isn’t going anywhere, the need of a oligarchy-timocracy-aristocracy mix isn’t going anywhere, the far left and right, the response to inequality, war, conflict, resource management, money, it is all here to stay. The only way to combat incorrect forces is to ensure correct values (like the virtues clearly laid down by works like Plato’s Republic and by all liberal philosophers since). Is it fear and human nature, is there a coordinated plot by international bankers, is it anti-western nation pulling strings in the background, or is it another nation with interests that are not our own? We can’t know the answers to these conspiratorial theories, but we do know what democracy, liberalism, capitalism, and Americanism look like, and we do know what technology we need to safeguard them. One technology is a separation of powers and Bill of Rights liberalism, and we cannot turn from our values in a paranoid attempt to stop a coup that we can barely explain. If we turn from the values, we start down a slippery slope, one where the nature of our values commands the invisible hand shadow government to act, not out of spite but duty. You can’t break a law in front of a police officer and expect no reaction, they are bound by duty, and you can’t turn a democracy into a totalitarian government in front of the Deep State, they are compelled to act by duty. Thus, there is a big slippery slope here. But luckily, we don’t have coups in America, we have elections every 2-4 years. Not because it is pretty, but because our Founders knew that people come in two types, and that these two natural left-right types could not disagree more politically, but could use their reason to agree on a smart center. The American way is not a way that pleases authoritarians, and that makes it even more pleasurable to find success in. John Locke and Baron de Montesquieu: Influencing the Founding Fathers. We either heed the words of Locke and Montesquieu or we abandon our values, we can’t have it both ways. In a liberal nation, there is no room for undemocratical despots and tyrants, theirs is the ideology of fear and power, ours is liberty and equality tempered by classically conservative limited authority and order for citizens and, when more authority and power need to be granted, in otherwise separate powers. Of course “Deep State” isn’t just an American thing, it is a thing of each nation, it is global thing. It describes the ingrained state and it makes it hard to have a full revolution in a Democratically-minded Republic. It in some ways, if we consider a global Deep State, describes why Fascism and Communism keep failing globally (the collective self interest to avoid extremes). If you want a Revolution, the Deep State makes it hard, doesn’t matter if you are left or right. Of course, the problem is. BIG PROBLEM: If a Despot fills the Deep State with cronies, or corporations do, etc then the General Interest / National Interest is not in line with the interest of the Deep State. If the Deep State is corrupted, then the body is sick by its nature. Despotism is a sick form of government. The will of the head, limbs, and organs cannot diverge from the General Will and the General Will is a synonym for the term National Interest. A despot can’t declare the National Interest, a specific special interest is always a specific special interest even if the Queen says it isn’t and uses the term “we”. Now, lets expand this concept to the Deep Culture. The Deep Culture might include teachers, news people, intellectuals, media personalities, etc. If one wants a Revolution, they have to not only undo the Deep State, they need to undo the Deep Culture. The problem is, if the Revolutionary wants a left-wing Revolution, then Deep State becomes code for “all right-wingers” in government and the nation, and if one wants a right-wing Revolution, then Deep State becomes code for “left-wingers”. Here the term is being used politically as code for “pure the political opposition” so we can create an authoritarian government. But we didn’t like Hitler and Stalin did we? We didn’t need a global Deep State to tell us that, we knew this as liberal republicans and Democrats, that western liberalism was better than despotism. The problem with “purging” all the left-wingers from a nation is generally the same problem with purging the right-wingers, the left and right are naturally occurring and most free people stand against despotism and tyranny. Of course there is a Deep State in every state that allows officials to stay in office or people of influence to stay in power. It is, as Madison would note, an advent of liberty. Term limits are one thing, but purges are another. In the modern day, we should be careful to distinguish between the concept of Deep State and the Concept of Purging Political Opposition from Government like it was Germany 1933 or Russia 1918. The Rise of Mussolini and the Fascists. If you want sweeping change like Mussolini did, the ingrained establishment, liberalism, democracy, and individualism are not your friends. 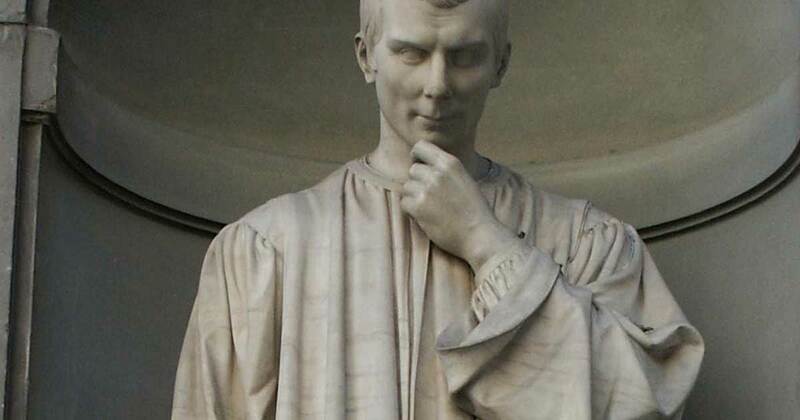 You must use Machiavellian criminal virtue to take the state if you want an authoritarian government, and that means you need to implant your own Deep State and Deep Culture. FACT: During the Night of the Long Knives the NAZIs purged the political opposition. Then tens of millions of dead later America arose a super power after defending liberalism and Americanism across the globe. You can imagine why the Guardians of America don’t take too kindly to people pushing Fascism or Communism over Americanism. The Deep State isn’t a person or people, it is an idea. You can “sing power to the people and not the establishment”, and that is respectable, but you can’t destroy ideas, and you can’t change American values. One must come to the center to meet American values from a moderate position, as is the purpose of the structure of the American Republic. June 30th, 1934: ‘The Night Of The Long Knives’. TIP: Obama used the term Deep State in his farewell speech referring to those on the left-and-right who would protect our Nation’s values, meanwhile the Trump administration has used the term as a sort of “political dog whistle” to signal that they plan to purge Government of left-wingers (like what they did with the DOJ). These two usages have gotten confused here in early 2017. The Deep State should, from a perspective of political science, not be seen as a political bias but as an national asset. If the Deep State is not on your side, you may want to consider your platform before a purge. It could be natural human reaction to radical policies more than political motivation. Even to the degree it is political motivation, national interests are different than left-right political interests, we have a diverse 320 million to consider, not just a 60 million who voted one way or another. Obama Farewell Speech FULL Event | ABC News. Obama explains the Deep State, but he didn’t mean “liberals ingrained in government” he meant Republicans and Democrats who support American interests and values and will protect American from Tyranny and Despotism. The idea this is being twisted is a pretty disturbing red flag.